No Place Like Home: Standing next to the man on the bicycle is Daniel Marentette and his son Amedee. Standing on the upper veranda left to right are Florence and Corrine Marentette, both born in the hotel, and their mother Edwidge (nee Janisse). Note the British American Brewery (est. 1882) sign promoting Cincinnati Cream Ale on the veranda rail. 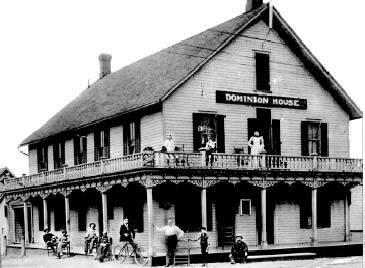 The Dominion House is the oldest remaining continuously run tavern in the Border Region. From its inception, when the stagecoach ran between Windsor and Amherstburg, it has served local residents and numerous travellers. When Frederick Neil published "The Township of Sandwich Past and Present in 1909", the Dominion House, owned by John McCarthy, had been operating at its present location for 26 years; 118 years later, it operates in the same building and location, having survived fifteen or sixteen different innkeepers. The Dominion House was named by Frank Dent in 1878 when it was on the west side of Bedford Street (Sandwich St.), although it had been a hotel dating back to 1859, operated by James Cotter and owned by Charles Askin. Albert Lininger ran the old hotel when it burned to the ground on the night of February 23 1883. In March of the same year, Mr. Lininger reopened the hotel across the street in an existing building, built by Francois Janisse, a local contractor, with a clapboard exterior, and a front porch and side topped by a railed veranda. The grand porch and veranda were removed in 1945 or 1946. By the late 1880s, my grandfather, Daniel Marentette, operated the house until his untimely death of heart failure at the bar on Saturday evening July 28th, 1902. My father often spoke of living at the hotel with his two sisters, and his mother cooking meals on a large wood stove. They raised hogs for personal use and to feed patrons; a garden behind the hotel supplied fresh vegetables, etc. Father told of farmers from LaSalle and River Canard hauling their produce by horse and wagon to Detroits Eastern Market, crossing the river by ferry on Friday night and returning Saturday. The horses would automatically turn into the lot on the west side of the building where a watering trough and well were located and refresh themselves while the owners would do likewise at the bar. The Dominion House played a role in the history of Sandwich, and as my father often recalled, juries from the old County Court house would dine at the hotel and Essex County Council members who would also spend off-session time at the hotel. Following the death of my grandfather, my grandmother sold the hotel to Eugene Breault, a long-time friend of the family, later elected Reeve of Sandwich and Police Magistrate in 1909 Following Breaults ownership, the hotel was purchased by Capt. John J. McCarthy, then Lorne White (1920-1922) was innkeeper during the first years of prohibition 1920-1922. The next owners, William and Jean Boyer (1923-1948) faced many problems, as did most hotel owners during the twenties and thirties including prohibition, the Depression and rationing of beer and restricted hours during WW2  it was not the best of times to run a tavern. One bright spot during this time was the construction of the Ambassador Bridge; Bill and his wife housed bridge workers at the hotel. Sid Walman arrived from Toronto after working for the Paramount Hotel in the Spadina-Dundas district, looking to buy into the restaurant business due to the high prices in the Toronto area. After 25 years, the Boyers sold their business to Walman in 1948. Soft spoken and congenial, Walman put the "DH" on the map with hospitality, good food and a great staff, catering to the University crowd, and the locals. He opened a basement lounge for poetry readings, etc. and many university professors held regular classes at the DH. In 1989 after 48 years, Sid sold his tavern to Amanda Heiser & Co., a long-time employee; by 1993, Ann Peterson, a former DH bartender, became a partner. In 1994, Ron Limarzi and Sam Simoff, both experienced food handlers, took over operation of the DH Within two years, they sold the business to Mike Balun and Natalie Bouliann, who are now operate this historic roadhouse.